Khargo: Furniture and Design: Khargo: Tip Jars - Meep Meep! 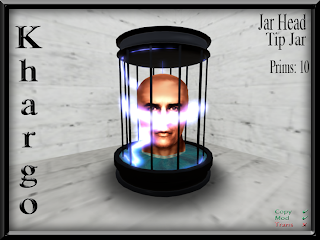 2 more tip jar releases with a cartoon inspired theme have arrived at our in world store. 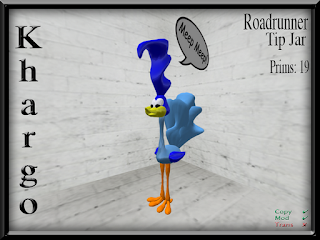 Roadrunner needs no explanation. Meep meep! Find it on the SL Marketplace here. Jar Head reminded us of the heads in jars in Futurama. It's on the SL Marketplace here. As always, our tip jars are made with the best sculpties, textures and scripts you can find. It's also packed with every option you can imagine including sound, particles, gift giving and thank you message as well as options to change tip jar name, fast pay tip amounts, colour of floating text, last payer, total amounts, highest payer and the ability to share your tips with others. ALL OUR TIP JARS ARE ALSO AVAILABLE AS A LOG ON OPTION FOR 750L$. Contact Keanu Kharg or Selkie Flatley meantime if you require this type of tip jar. 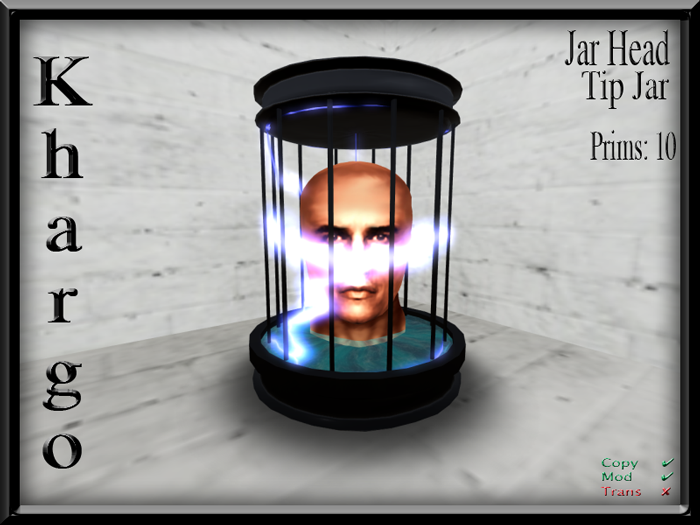 All our tip jars can be found in world at our Tip Jar Store or on the SL Marketplace.